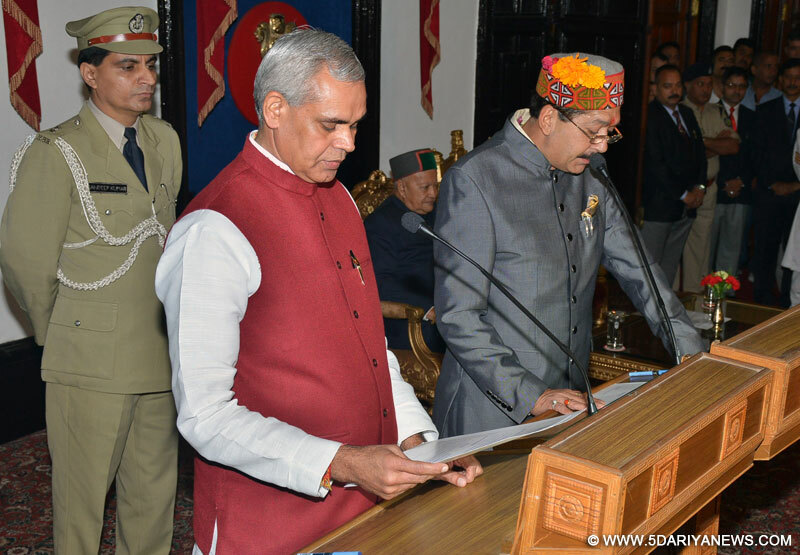 Governor Acharya Devvrat administering the oath of office and secrecy to Shri Karan Singh as Cabinet Minister at Raj Bhawan, Shimla on 27 August 2015. Governor Acharya Devvrat administered the oath of office and secrecy to MLA from Banjar Shri Karan Singh as the 11th Cabinet Minister of the State in a simple but impressive ceremony held at Rajbhawan here today. Chief Minister Shri Virbhadra Singh and his wife Smt Pratibha Singh were also present on the occasion.Chief Secretary Shri P Mitra conducted the proceedings.Speaker H P Vidhan Sabha Shri B B L Butail, Cabinet Ministers, Smt Vidya Stokes, Shri Kaul Singh Thakur, Shri G S Bali, Shri Sujan Singh Pathania, Shri Thakur Singh Bharmouri, Shri Mukesh Agnihotri, Shri Sudhir Sharma, Shri Prakash Chaudhary, Dr. (Col.) Dhaniram Shandil, Shri Anil Sharma,Chief Parliamentary Secretaries, MLAs, State President HPCC, Shri Sukhwinder Singh Sukhu, Former Ministers and MLAs Chairpersons and Vice Chairpersons of various Boards and Corporations, Advisors to Chief Minister, State Election Commissioner, Shri T. G. Negi Additional Chief Secretaries, DGP Shri Sanjay Kumar, senior officers of State Government and people of Banjar were present on the occasion.